* Mike Males has written an important article about some facts related to crime and imprisonment. Just 15 years ago, young adults ages 18-24 were nearly twice as likely to be imprisoned as their middle-aged parents (age 45-54). 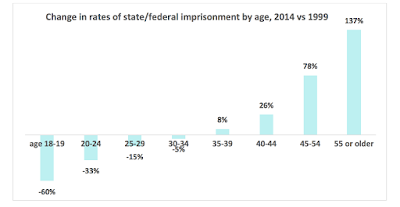 Today, after tremendous shifts both in numbers and per-capita imprisonment rates shown in the charts, young adults are less likely to be locked up than the middle aged. Kevin Drum says we can thank the EPA. * You may have heard that President Obama is traveling to Austin, TX to be the first POTUS to give a speech at South by Southwest. Jason Goldman, White House Chief Digital Officer, gives us a preview of what he’s going to talk about. Coming from the tech industry, I was aware of the ways President Obama, his campaigns and the White House have used technology to help people find “the imperative of citizenship.” Tech, it seemed to me, was changing how our government engages with – and provides services to – people, and that’s exciting. But the vision described in the Selma speech went further. This story is not about the transformative power of technology, but a way of governing that empowers people to find the “imperative of citizenship.” Giving people a voice, enabling them to be heard, and working with them to solve big problems is the animating principle of President Obama’s campaign and the core of his presidency. In Selma, the President declared “America is not the project of any one person. Because the single-most powerful word in our democracy is the word ‘We’…That word is owned by no one. It belongs to everyone.” It’s why he sought office and what drives his Administration. It’s how we make change in America. Technology has the power to enhance this work. * Ben Carson says that “there are two different Donald Trumps.” Apparently, he decided to endorse one of them. He just didn’t say which one. * Paul Krugman (who considers himself a “soft opponent” of TPP) says essentially the same thing I wrote about yesterday. And anyone ragging on about those past [trade] deals, like Mr. Trump or Mr. Sanders, should be asked what, exactly, he proposes doing now. Are they saying that we should rip up America’s international agreements? * Finally, who says you can’t engage in a little point and laugh at a state dinner for the Canadian Prime Minister?